Oh friends, I’ve been having lots of fun partying with some awesome bloggers in the So You Think You’re Crafty contest. Today I’d like to share with you my tutorial for my silverware kitchen clock. The challenge for the first week was “In The Kitchen.” I thought it would be fun to make something I could use in my kitchen made from kitchen items. I used a charger plate for the face and silverware for hands. To get started let’s gather some supplies! I started by drilling a hole the size of the clock kit. I had to drill it a couple times to make sure that the clock kit fit perfectly. I used a green spray paint to paint the charger plate. Spray a light layer of paint and let dry. Repeat until completely covered. The key to good spray painting is light layers. Don’t lay it on too thick. Set aside the clock face. Using a drill or drill press, drill holes in the silverware. To decide where to place the holes put the plate clock face on the clock kit and see where you want the holes. Make sure that there is enough difference to look like a minute hand and an hour hand. Using the hour and second hands from the clock kit makes it easier to know how large to make the holes. This is IMPORTANT, so that the silverware will fit on the clock kit correctly. Once the holes are drilled, the silverware will need to be flattened so that there will be enough clearance as the hands tick around the clock. Use a rubber mallet to flatten the silverware. Using a rubber mallet will help prevent dings in the silverware. If you are frustrated this is a great activity! If you want to dress up the clock face with a vinyl decal or rub-on add it now. I used this white scroll decal. My kitchen is white, black and green, so it ties it in perfectly. For the numbers I just used chipboard numbers that I painted black. Use craft paint and a brush to cover the numbers, or if you want cut out vinyl numbers. I like the the chipboard numbers give the clock more dimension. Once the painted chipboard numbers are dry, I used super glue to fix the numbers to the charger plate. Let the super glue dry and you are almost done! The instructions on the back will help a lot here. Put the charger plate on the clock kit, then add the silverware hands and second hand. Complete! You have created this fabulous silverware kitchen clock. Isn’t it just beautiful. I am in love with the kitchen clock. I’m so glad that it is something so unique and vintage. I love the green, the silverware and that now I’ve got a great decor piece to brighten up my kitchen. I hope you’ve been following along with the competition and will continue to vote throughout the next few weeks! For those of you who have thanks so much! 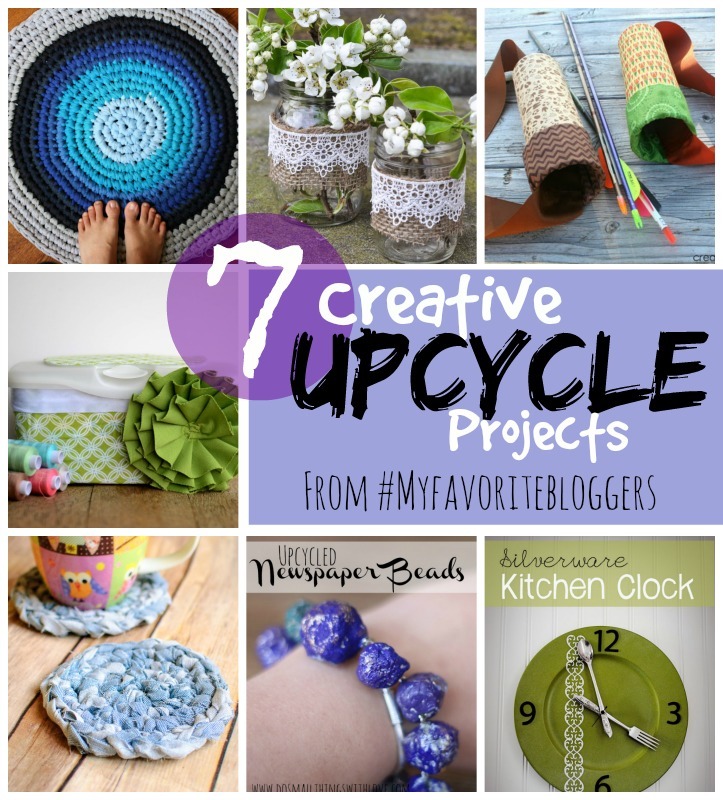 Plus, I’ve got a few other creative upcycle ideas from #myfavoritebloggers! Go on and share the love! Earth Day is right around the corner and I just love a good upcycled project. It really shows that reusing something can be cool. There are so many ways to upcycle everyday items. Check out all these amazingly creative upcycled projects, just in time for Earth Day. Hop around and give some of #myfavoritebloggers some love. Very cool. That would look so good in a kitchen or dining room. This is such a fun idea! I love the green spray paint that you used. We’ll be featuring this over at Someday Crafts tomorrow! Just saw this at Someday Crafts and wanted to stop over to tell you how much I love it! Just pinned! I LOVE this! What a neat idea! It turned out wonderfully. I think I’ll be trying this for our new kitchen once we move! Meredith @ unOriginalMom recently posted…Fall Tailgating Party with M&M’s and Mott’s Apple Juice! So cute, Emily! I love the silverware as watch hands – it’s really clever! Love this project! This is so versatile, just by changing number style, paint color, and decals. Question: Do I need to buy a certain size clock kit? I wonder about the motor’s ability to turn heavy silverware clock hands. It depends on the thickness of the silverware and the plate or back you use. There are different sizes of the screw length that hold it together. I would measure first and then buy. I would also try to find light silverware, because it does help with the motor being able to work.